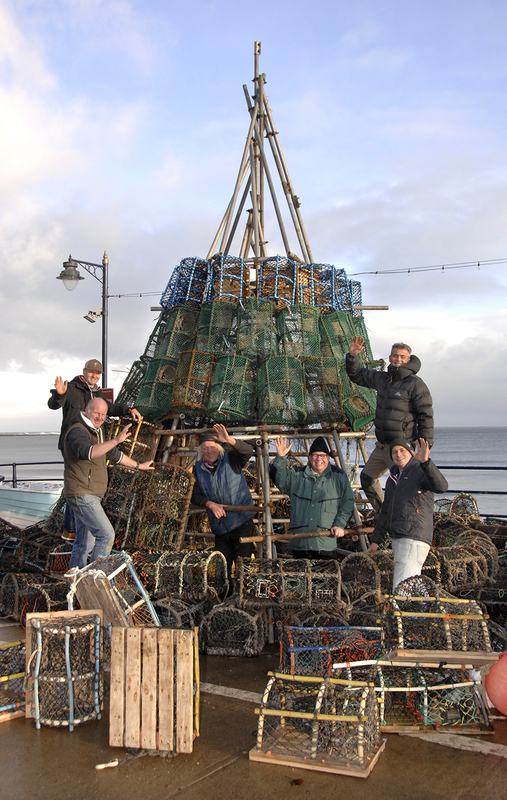 Salmon nets, crab pots and orange buoys adorn a big modern ‘fishtivity’ tree in Filey. Constructed with scaffold poles and a forklift, the 25ft tree is topped with a 4ft-high leaping salmon. It has about 1,600 eco-friendly LED lights attached to it. A local child has labelled it a ‘fishtivity’ tree instead of a nativity tree, says Rex Harrison, one of five locals behind the festive project. The switch-on, at 6pm on Friday 1 December, will be covered by Look North and will feature a choir from the town’s junior school, says Rex. “We’re hoping to get a snow machine as well”, he adds. A collection will be taken for local youth groups such as sea cadets and girl guides. The lights will be on all day and most of the night until after Christmas. The tree has been sponsored by numerous local businesses and will now appear on the Coble Landing every Christmas. “The volunteers and sponsors have been absolutely first class”, Rex says. The sponsors include Chris Coletta, White Lodge Hotel, Downcliffe House Hotel, Beachdale Guesthouse, Trout Cottage, the Cobbler’s Arms, the Star Inn, Holdsworth’s Amusements, Ingham’s Fish Restaurant, Shoe Boutique, Baker’s Snacks, Dixon’s, White House & Cabins, Angela’s Tearoom, Bikeabout, Scaife Fabrications, Filey fishermen and Filey Tourism Association.